The KONG Cat Kickeroo Cuddler is an interactive toy for your cat. The toy is made from various textures. This allows your cat to sharpen its nails properly. What's more, the scent of the catnip and the rustling noise ensure that your cat is challenged and stays focused on the game. The Kickeroo Cuddler is an interactive toy for your cat. The toy is made from various textures. This allows the Kickeroo Cuddler to offer your cat the opportunity to properly sharpen its nails. 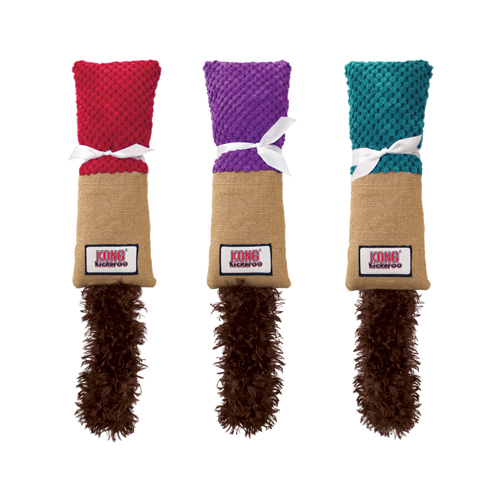 What's more, the toy's tail consists of flexible material, making the tail move along when playing with it. This makes the toy challenging for your cat. In addition, the scent of the catnip and the rustling noise made by the toy keep your cat focused on the toy. The Kickeroo Cuddler is available in three colours, red, purple or blue. You cannot choose the colour. This product is selected at random. Have you used KONG Cat - Kickeroo Cuddler before? Let us know what you think about this product.